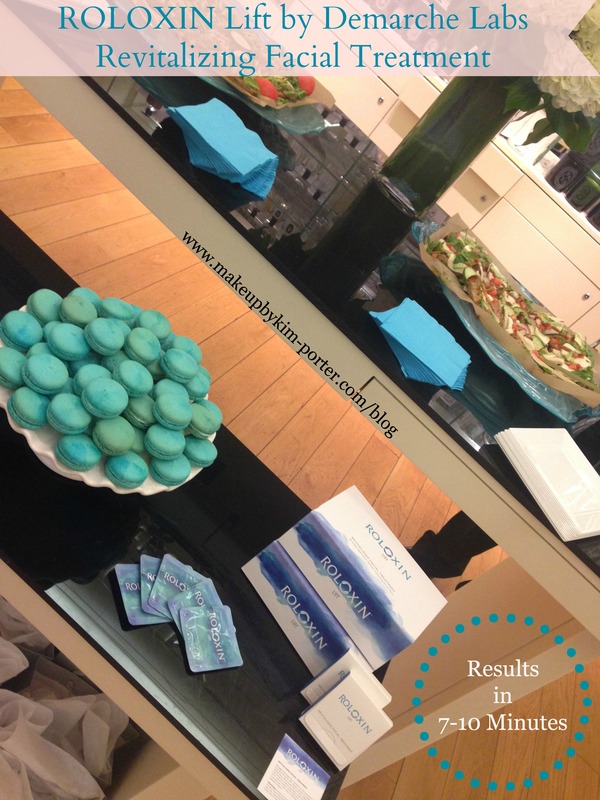 I attended the debut of the Roloxin Lift, an instant wrinkle-smoothing treatment, by Dermarché Labs, which took at the SoHo New York City location of SpaceNK. During the event I got to test out Roloxin Lift, and chat with one of the founding partners of Dermarché Labs. You’re probably wondering why in the world would I attend an event geared towards a product that instantly smooths wrinkles, right? Well, if you read my blog you’d know that at the tender age of 29, I am all about prevention. Plus, I always like getting the scoop on new skincare and beauty products, and sharing it with my readers. Roloxin Lift is part of Demarche Lab’s new category of skincare products: instant skincare. Roloxin Lift claims to immediately reduce – I’m talking within 7-10 minutes- the appearance of both wrinkles and pores, thus giving wrinkles a smoother look and texture, as well as provide a more even skin tone. Roloxin Lift has a unique formulation of hydrophilic acid and hydrophobic silica particles, which “form a latticework” over the skin to create a bright, smooth, luminous appearance. Although I have no wrinkles, and was told “You have perfect skin. You don’t need anything, really.” I still gave the product a try. It was all in good fun, and after rinsing off Roloxin Lift I was left with smoother skin than what I’d walked in with. 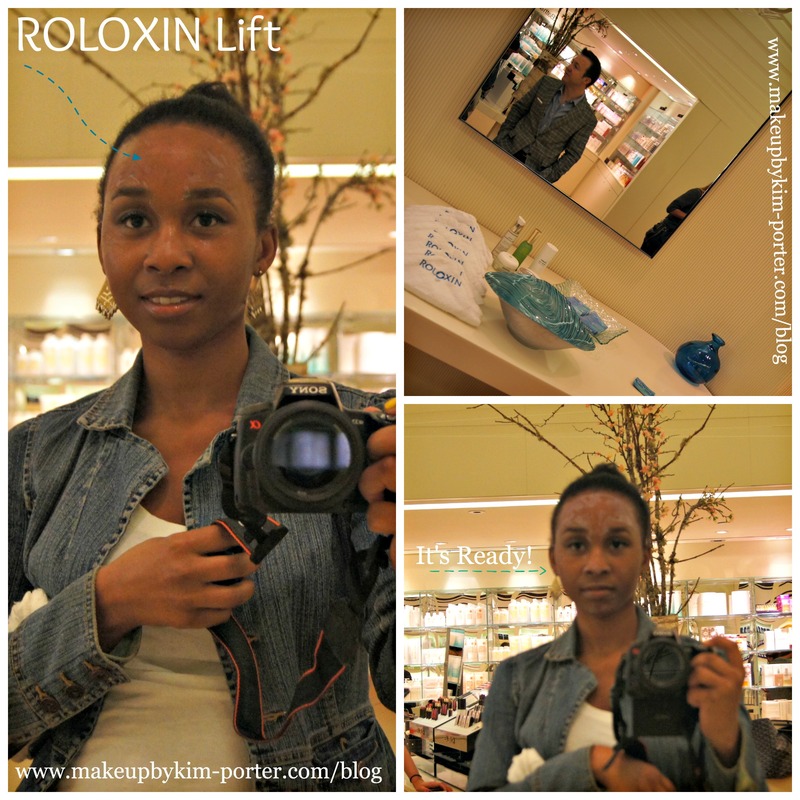 The process: Prior to applying Roloxin Lift I had to remove all of my makeup, except my eyeshadow and brows. Afterwards, I wet my skin, activated the packet, and then applied Roloxin Lift. After about 5 minutes of having on Roloxin Lift, I noticed my skin tingling, and it tightening as the product dried. Once the product was completely dry, the tingling stopped, and my face was tight! It was time to rinse. After rinsing, there was still tightness, and I was reassured the tigthness was not due to the product drying out the skin, but, in fact, due to the product working. This is why it’s recommended to moisturize immediately after using the product so I used Eve Lom Day Cream. Although I cannot attest to the anti-aging properties of Roloxin Lift, I do know that it did smooth out my skin; my skin was baby soft afterwards. The makeup artist who re-applied my makeup again, complimented me on my skin. He didn’t even use a primer prior to applying the Laura Mercier Foundation, and it went on smoothly. The only thing I didn’t like about the Roloxin Lift product was the price. I mean, I just bought a house; I’m on a budget, so splurging on skincare is the last thing on my mind, but I did like the results. To experience Roloxin Lift’s instant results, it’s going to put you back a pretty penny; 10 treatments for $110 (or $270/ 30). The good thing about Roloxin Lift is that you get more than enough product in one packet for your face that you may even be able to get two applications from one packet, thus cutting costs in half. 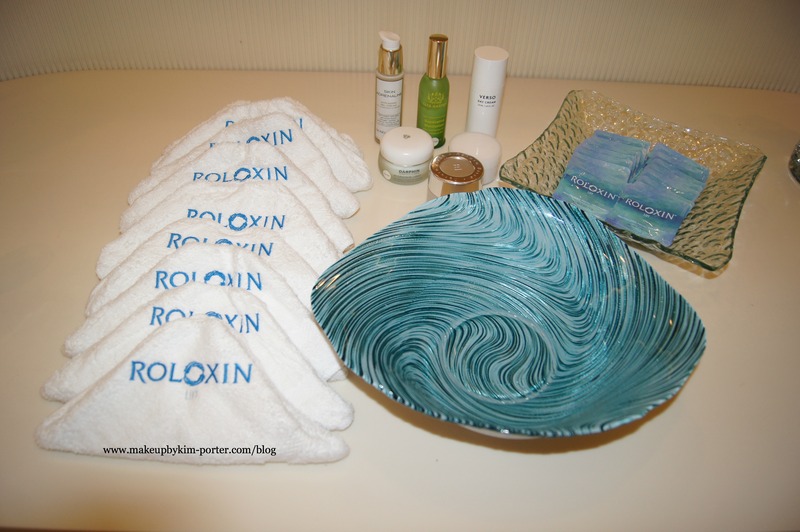 If you have the money to splurge, and are looking to smooth out some fine lines and wrinkles, minimize pores, or just experience smoother skin, period, Roloxin Lift can be purchased at SpaceNK.com or RonRobinson.com. Is Roloxin Lift a product you would want to try? Disclosure: I attended a media preview event, and was provided product for review consideration. All opinions are my own and are honest. This sounds interesting, I definitely think I'll be more willing to shell out the $$ for this stuff when I feel like I'm aging, but I bet NOW, before my skin is looking older, is when I really need to start doing it! Well, you had me right up until I read the price. *sigh* Isn't that always how it goes? This sounds super interesting. And girl you totally have gorgeous skin. I so want to try this!!! My recent post Getting Personal – Family Vacations Through the Years! Interesting product! Thanks for the review! Very interesting! I´ve never heard of it before. Sounds great, but yes, the price is prohibitive for me. I like the results you experienced! Oh I would so try this!! Oh dang! That price is steeeep. But hey, the things we'll pay for beauty, right? Hmmm sounds interesting. That price is a little steep for me tho. Pricey but still sounds really interesting! If it really works for wrinkles – and that quickly – I'm sure it's worth the price! Especially for a special event or photographs. I'm curious to try this! Whoa – I just spit my water all over the keyboard… that price is some major money. I think the price is quite good for 10 treatments. I don't think I need it for my skin but I think it sounds good. It really is all about prevention. Nice photos! This sounds like it would be a great gift for someone. I want to try this… but the price is holding me back a little. I am 47 and use Peter Thomas Roth products which are awesome. I got a free sample of Roloxin and was truly amazed at the lift! It really did bring my face back in time. Tightened my jawline and my complexion was so smooth. The price is steep but I would use this for special occasions. Heartbroken when I was back to my normal slightly saggy self the next day.